Linux Shovel Knight (3.3) "Plague of Shadows" in 35:23.97 by keylie. Shovel Knight is a retro-esque 2D platformer released by Yacht Club Games in 2014, and inspired by mechanics from NES platform games. 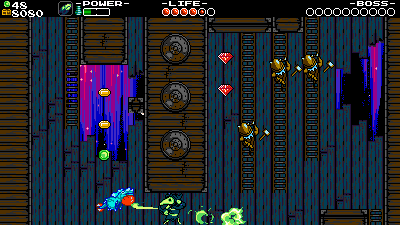 It initially featured Shovel Knight as the playable character, but then received additional campaigns with two other playable characters, namely Plague Knight and Specter Knight, with King Knight coming in 2019.
keylie bursts his way through the Plague of Shadows campaign (which stars Plague Knight) and defeats the Plague of Shadows and the Corrupted Essence in record time. The encodes feature commentary as soft subtitles.